Sebastian was a chorister at Christ Church Cathedral, Oxford (alongside Gulliver Ralston, one of our previous Directors of Music) before moving to HarrowSchool with the top music scholarship. He was then awarded the Bristol University Organ Scholarship. After this, he moved to Chichester Cathedral as Organ Scholar. In 2005, Sebastian was appointed Director of Music at St Matthew’s Church, Northampton, a post held alongside teaching piano, organ, and theory at Eton College. Sebastian is an accomplished choral director and teacher with a growing reputation. He is a Fellow of the Royal College of Organists and a prize-winner in the Choral Training Diploma examination from the College. 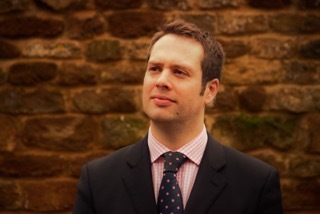 He was recently Head of Academic Music and Assistant Director of Music at Bloxham School. Whilst at Bristol University, Sebastian founded The Howells Voices, a mixed voiced choir inspired by the music of Herbert Howells. The choir recommenced in 2012, and they take occupancy 3 times a year in Britain’s Cathedrals. Recent venues include, Salisbury, Westminster Abbey and York Minster. Based in Oxford, he is now pursuing a freelance career as a choral conductor and organist. His recent solo engagements include recitals at Westminster Abbey, Westminster Cathedral, King’s College Cambridge, and St Paul’s Cathedral. Sebastian has also made appearances as a performer and speaker on local and national television and radio. Sebastian is gaining a reputation for commissioning new works for choir and organ. The Angels of Creation Commissions are a collection of organ works composed for and premiered by Sebastian. A recording made on the organ of Keble College, Oxford is out later this year and a recital at Notre Dame Cathedral, Paris is booked for the summer of 2017. The BBQ was held on the 4th September in Pamela’s garden under a rather cloudy sky. As usual Tony did the cooking while members of the choir brought salads and deserts. Despite the rather low attendance it was a very pleasant afternoon.